The project purpose is to increase the capacity of Pacific Island Countries to negotiate adaptations that will enhance the resilience of tuna stocks and fisheries to the affects of IPCC projected global warming scenarios during the 21st century, by building on and extending the model development and applications already undertaken. The project will undertake analyses of four tuna species (skipjack, bigeye, yellowfin, albacore) to characterize the potential impact of climate change on Pacifc tuna stocks. These analyses will provide a synthesis of how the distributions of tuna stocks are likely to shift with climate change. It will provide information that Pacific Island Countries require to evaluate and select appropriate adaptation measures (for example, modifying access rights to foreign fleets, vessel day trading). 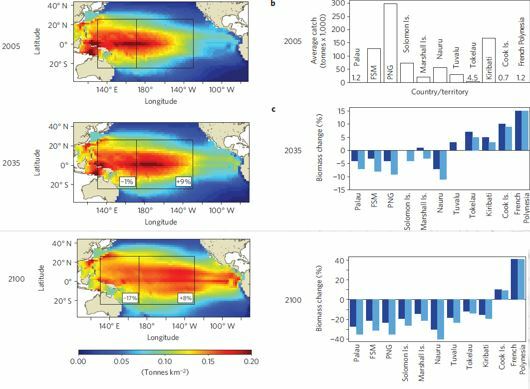 Projected distributions of skipjack tuna biomass across the tropical Pacific ocean under the IPCC SRES A2 emissions scenario. From Bell et al. (Nature Climate Change 2013, DOI: 10.1038/NCLIMATE1838). Lehodey P., Senina I., Calmettes B, Hampton J, Nicol S. (2013). Modelling the impact of climate change on Pacific skipjack tuna population and fisheries. Climatic Change, DOI 10.1007/s10584-012-0595-1, 119 (1): 95-109. Bell JD, Ganachaud A., Gehrke PC, Griffiths SP, Hobday AJ, Hoegh-Guldberg O, Johnson, JE Le Borgne R, Lehodey P, Lough JM, Matear RJ, Pickering TD, Pratchett MS, Sen Gupta A, Senina I and Waycott M., (2013) Tropical Pacific fisheries and aquaculture will respond differently to climate change. Nature Climate Change, 3: 591–599.